Joni Jahnia Mitchell. A lover of nature since the time she was small, she has always found a sense of self being immersed in the natural world. She discovered a new way of connecting with nature after she was inspired by reading the book, The Tracker, by Tom Brown Jr, and shortly afterwards started attending the Tracker School in New Jersey in 2009. In 2009 she lived there as a caretaker, having the opportunity to become fully immersed in primitive living for a year. After living at the Tracker School and being forever transformed, she wanted to share her experience and knowledge with others, and felt called to work with children especially. That autumn she completed the teacher Certification Program through The Children Of The Earth Foundation in 2010 and became an instructor for their summer camp. She continued teaching when she moved back out west, including working with Trackers NW in Oregon, and at Four Earth Elements Education in Nevada City. 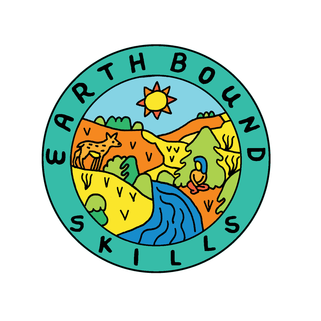 In 2013 Jahnia and her partner Matthew decided to start up something in their own town, and Earthbound Skills was born. Jahnia is also a certified herbalist from the California School of Herbal Studies and a certified naturalist through The University of California, and has also taught at multiple primitive skills gatherings since 2014. She is also a lead instructor and administrator. Matthew Knight has been drawn to nature all his life. He is a certified naturalist through The University of California and a graduate of the art of mentoring program by Jon Young. Matthew is a student at The Tom Brown Jr. Tracker School where he has been studying survival skills and wilderness therapy since 2008. There he completed the Coyote Teaching Program which emphasizes the use of mentor skills. After learning these survival skills, Jahnia and Matthew both lived for a year in their own hand built primitive structure known as a mandan. Matthew is also currently working for Four Earth Elements Education in Nevada City sharing his knowledge to help guide children and others back to the Earth through nature awareness & wilderness skills. Wyatt Hersey is a naturalist and artist who has been following the call of nature since he was a child. He works as a Field Ornithologist in the summer months in the Norther Sierra Nevada and Southern Cascades, and spends the winters living in Chico. He has a passion for all the flora and fauna of the Earth but is particularly gripped by the life of birds and the wisdom they offer, as well as the art of tracking and subsistence. Wyatt is moved by the power that reconnecting to our local landscapes offers, and is passionate about the resurgence of nature connection in the world today. Wyatt has a B.S. in Natural History from The Evergreen State College in Olympia, WA, has completed the Kamana Naturalist Training Program developed by Wilderness Awareness School up to level 3, has attended The Art of Mentoring as well as various Bird Language workshops through the 8 Shields Institute and has led numerous workshops with Chico's local Altacal Audubon Society. *Wyatt is also an incredible artist, and is the one who has designed our logo that is on our home page, as well as our t-shirt design! **Wyatt is traveling for the spring semester and will be back in the fall. Rachel Rickard is truly a nature spirit. She has lived with her partner and children in three National Forests in Northern California since 2010. Throughout this experience she has embraced the opportunity to hone her skills, awareness, and most importantly trust in the natural world. She has spent three seasons in a Teepee, deep in the forests of Trinity County as a caretaker at the River Spirit School of Natural Living. Through her immersions into the wild while raising her children, she has learned that some of the most important things kids need to thrive in nature are their awareness skills and sense of adventure, both which she enjoys cultivating. Her family has been hunting, gathering and growing much of their food since 2012. She has been able to share what she has learned by teaching workshops at several Primitive Skills and Women's Gatherings. She is also a certified herbalist through the Green Medicine Herb School and has been studying and using natural therapies since 2002. She creates wild crafted medicine and is a practicing herbalist under the name Wild Earth Brews. She is intimately involved in exploring the bridge for humanity and our children between ancestral traditions and the evolving modern world. Rachel loves the opportunities to rewild herself and her family, while cultivating a deep connection to the cycles of nature. Ian Wallick Colunga is a student in the field of Environmental Science, specializing in Applied Ecology at California State University, Chico. He enjoys working part time at a local organic farm and is an avid rock climber. More importantly, he is a committed steward of the natural world. He began to cultivate a deep love and respect for nature as a young boy, when he, his family and extended family would spend a week each winter camping under the stars in Death Valley National Park. He then spent twelve years performing in the circus and furthered his reverence for and devotion to the Earth with frequent climbing and hiking adventures in Joshua Tree National Park and the San Bernardino National Forest. He has also traveled to the mountains, jungles and ancient ruins of Belize, Guatemala, Peru, Bolivia, Chile, and Ecuador. Today, Ian is passionate about learning and passing on knowledge regarding edible and medicinal plants and fungi, tracking, ecology, and traditional survival methods. He truly believes that the salvation of the Earth lies in the natural education of young people and in the fostering of a loving and respectful attitude towards all living things.